This volume presents the first edition of the Arabic translation, by Hunayn ibn Ishaq, of Galen's Critical Days (De diebus decretoriis), together with the first translation of the text into a modern language. 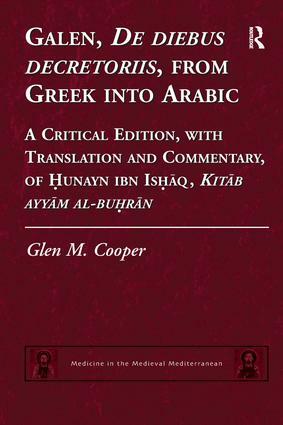 The substantial introduction contextualizes the treatise within the Greek and Arabic traditions. Galen's Critical Days was a founding text of astrological medicine. In febrile illnesses, the critical days are the days on which an especially severe pattern of symptoms, a crisis, was likely to occur. The crisis was thought to expel the disease-producing substances from the body. If its precise timing were known, the physician could prepare the patient so that the crisis would be most beneficial. After identifying the critical days based on empirical data and showing how to use them in therapy, Galen explains the critical days via the moon's influence. In the historical introduction Glen Cooper discusses the translation of the Critical Days in Arabic, and adumbrates its possible significance in the intellectual debates and political rivalries among the 9th-century Baghdad elite. It is argued that Galen originally composed the Critical Days both to confound the Skeptics of his own day and to refute a purely mathematical, rationalist approach to science. These features made the text useful in the rivalries between Baghdad scholars. Al-Kindi (d.c. 866) famously propounded a mathematical approach to science akin to the latter. The scholar-bureaucrat responsible for funding this translation, Muhammad ibn Musa (d. 873), al-Kindi's nemesis, may have found the treatise useful in refuting that approach. The commentary and notes to the facing page translation address issues of translation, as well as important concepts. Contents: Foreword; Transliteration conventions; The scope of the present study; Part I Historical Background: Introduction; The Critical Days in Arabic; An historical reconstruction; The sciences in the Critical Days; Sources of the edition. Part II Edition and Translation of the De diebus decretoriis; Signs and conventions employed in the Apparatus Criticus; The Critical Days: Arabic edition: Book I; Book II; Book III; English translation: Book I; Book II; Book III. Part III Commentary: Preface to commentary; Referencing the main text; Book I; Book II; Book III. Part IV Appendices; Bibliography; Indices.